Clinical guidelines are used everyday by thousands of doctors around the world. Accessing and keeping up to date with these articles can often be challenging and time consuming. Clinical Guidelines is a resource app that is aimed at those who are involved in developing and implementing local guidelines. 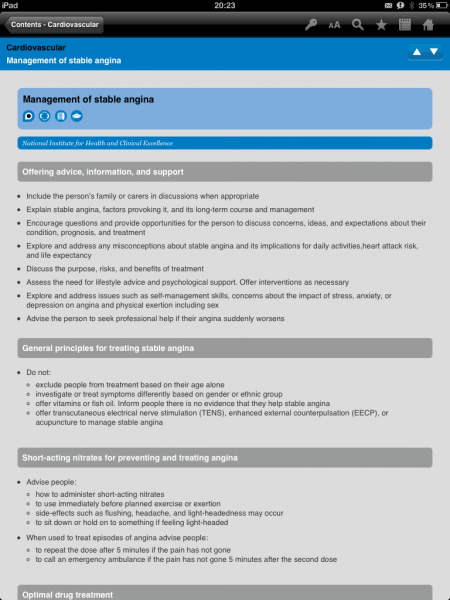 Developed in conjunction with AstraZeneca[see ed note at the bottom], Guidelines contains information from a range of sources including NICE, Dept. of Health, National Bodies and also working party guidelines. The summaries are colour coded. Systematic reviews and guidelines published by the National Institute for Clinical Excellence (NICE) or the Dept. Of Health are colour coded blue. National guidelines produced by independent professional bodies are highlighted in green. The content of the guideline must be independent of and not influenced by commercial sponsorship of the working party. Opening the app presents the user with a number of options: the guidelines, search, favorites, saved notes and information related to the app. 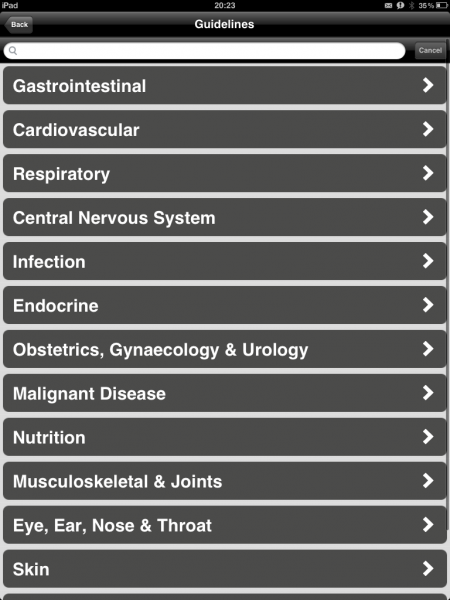 Tapping on the guidelines option brings the user to a list of specialties such as gastrointestinal and cardiovascular. This menu is easily navigated to a list of guidelines. Color coding and a subtitles make it easy to tell where a certain guideline is from. Browsing the information from the guideline is straightforward and there are additional options to add notes to the guideline, change the font size, or save the guideline as a favorite. One significant omission is the inability to share a particular guideline via email — although it is possible to copy and paste the text manually. One feature which was useful was the hyperlink to the original article at the end of each guideline. 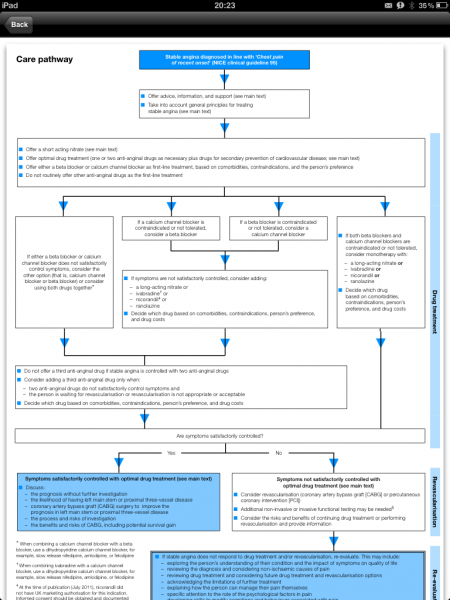 The flowcharts included are large and easy to read — but again, there was no option to export this. The search function from the homepage is very useful and splits results by specialty (see screenshot). This is considerably better than the search function accessible from the Guidelines page which only sorts by the major specialties. The usefulness of any guideline app is based on how up to date the information is. To that end, the app is updated three times a year to maintain current standards. However it is not clear if this is automatic (which would be easy) or if you have to manually download a new app (not so helpful). One thing that may potentially improve this app is to make the date that a guideline was last updated more clear so that healthcare professionals can easily tell how long it has been since a guideline was last updated. 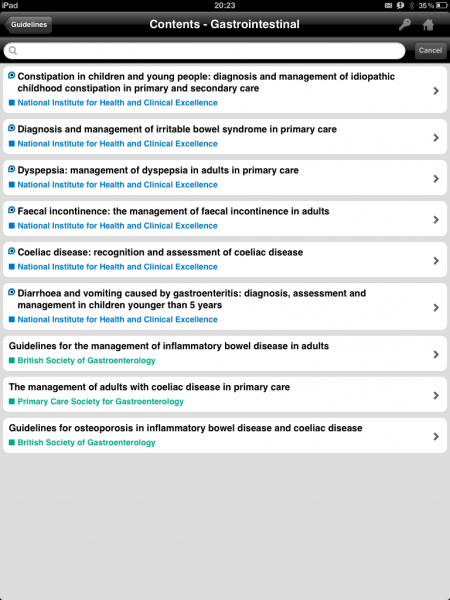 Guidelines is a useful app for healthcare professionals who want a relatively complete set of guidelines from a range of sources. It completes this function effectively through use of a robust search function and clear layout. 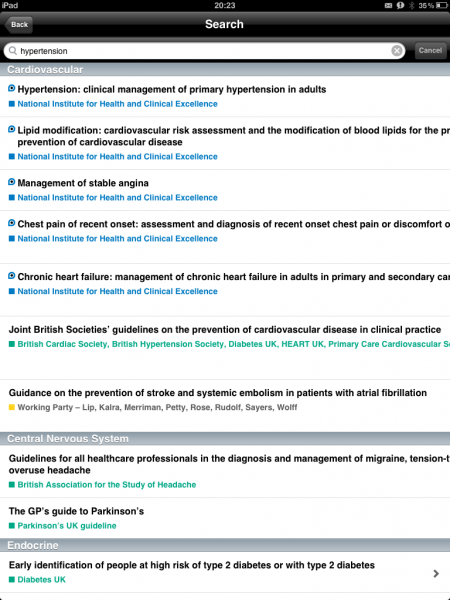 Content for the Guidelines handbook and app has been developed independently by MGP Ltd with no input from AstraZeneca. AstraZeneca had no input into the design or development of the app. Their sponsorship allows us to offer the app as a free download and they in turn get a link from the app to their website. any plans for this app to be available in the U.S.? on the android play store, the nice guidelines app is there since a few months and another one exists since much longer and both have the same guidelines. the SIGN guidelines apps are fine too. if you cant find the official nice app then look if you can find the earlier non official one. i dont know if there are two versions for itunes though.